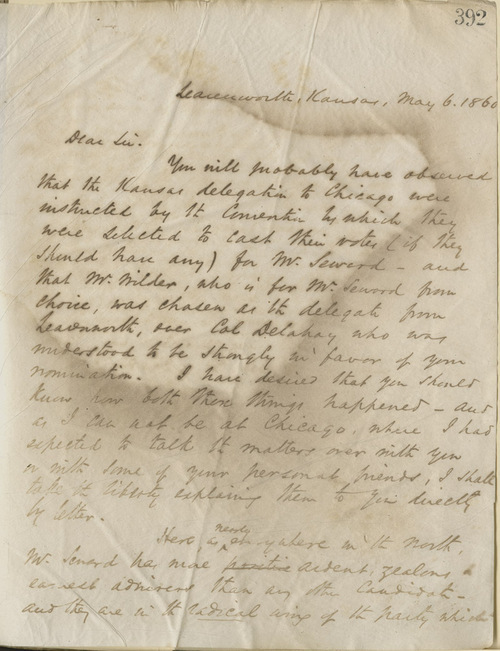 On May 6, 1860, ten days before the Republican convention convened in Chicago, Illinois, Ewing wrote to Abraham Lincoln at Springfield, Ill., regarding the fact that the Kansas Republican delegation had been "instructed by the Convention by which they were selected to cast their votes (if they should have any) for Mr. Seward [considered by most a more radical candidate]. . ." Ewing wanted to explain how this happened and why D.W. Wilder, a strong Seward man, was the Leavenworth delegate rather than "Col. Delahay who was understood to be strongly in favor of your nomination."